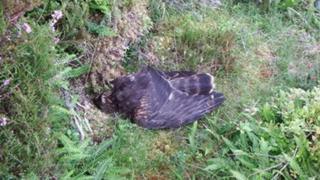 A satellite tagged bird of prey died after being shot in the Cairngorms National Park, RSPB Scotland has said. The young male hen harrier fledged last summer and was found dead a few months later near Newtonmore. A number of examinations were done of the carcase, including by a laboratory at Scotland's Rural College. Scientists identified injuries likely to have been caused by a shot gun. Police Scotland said its enquiries into the case were ongoing. RSPB Scotland became concerned for the bird, known as Lad, in September last year after its tag indicated that it had stopped moving.